On the 13th May a very special event will open for just 3 days. The event is Join Hands for Nepal. I know we are often asked to donate for charity causes, but this one is special. It is to help support the World Food Programme provide food for Nepal, which I am sure you know was totally devastated by a dreadful earthquake that killed over 8000 people, and left 2.8 million Nepalese displaced without ready access to even the most basics like food. And with another quake today, the situation is dire. I don't usually link to other people's blogs, but this is about the best summary of the event, with all relevant links I have found. 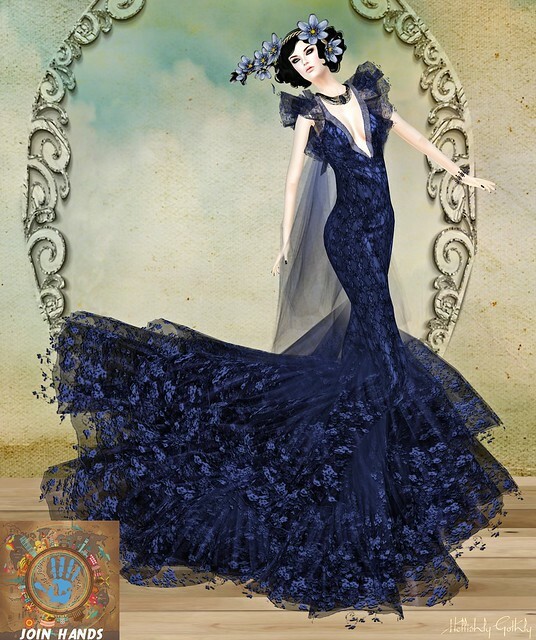 AZUL has contributed 3 outfits for the event, this gorgeous, head-turning blue gown named Camille is one of them. I'm also wearing Mabel hair by Lamb, for the TAG Gacha event, but still available. A lovely flower spray in blues from LODE, and a very pretty pale, pale skin from Glam Affair.